How’s your week going? 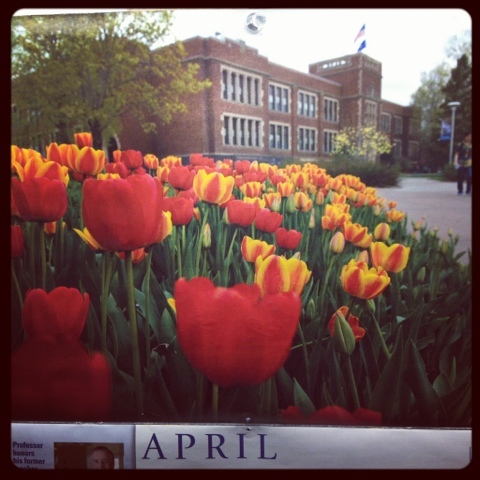 Mine has gotten progressively better…it started out really bad on Monday. 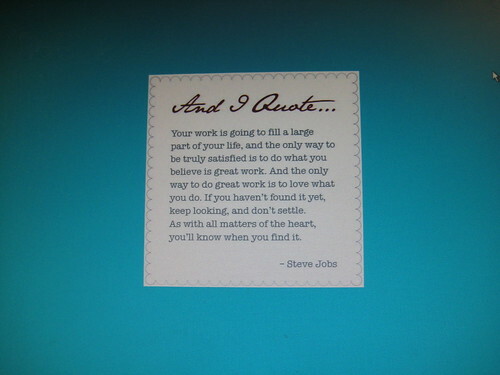 So much so that I posted my favorite Steve Jobs quote as my computer background at work. Yesterday was ok despite having a tummy ache (I think the frozen yogurt did me in on Sunday), and today, I actually had a wonderful day. I even had my work review, which covered not only the last year of my job, but the last two, and it went very well. 🙂 Hooray for a raise! 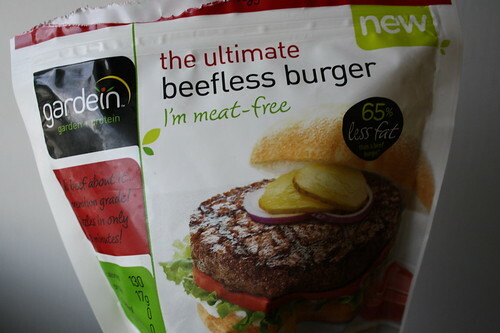 This week, I’ve tried out a few new to me food products…Amy’s Organic Light in Sodium bean and cheese burrito, Mamma Chia drinks and Gardein Ultimate Beefless burgers. 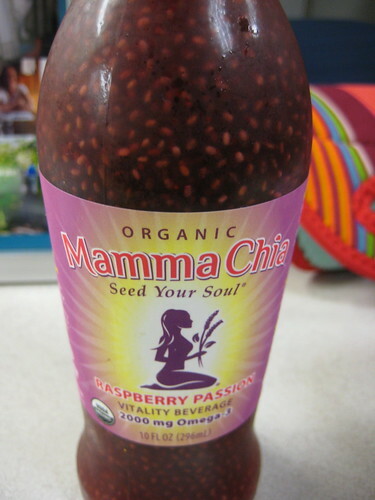 I LOVED the Mamma Chia drink. 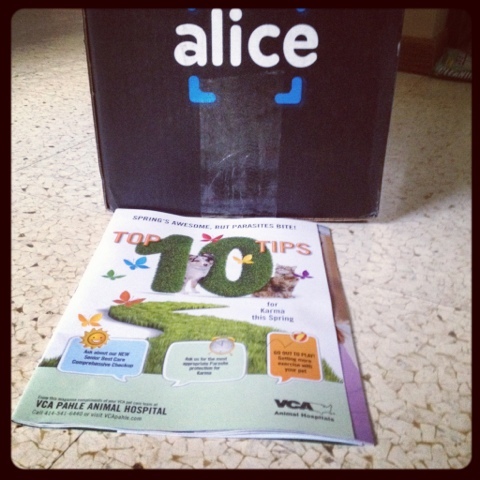 I received some coupons from the company and they allowed me to get the drinks for free. 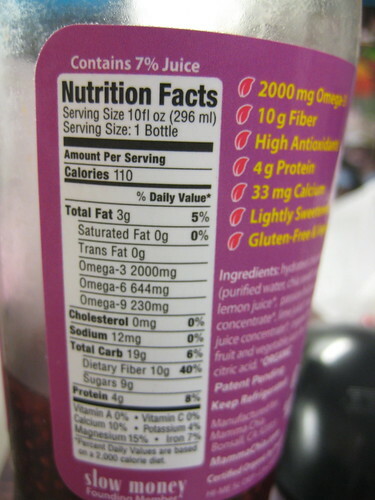 The Milwaukee Whole Foods was charging was $2.69 per drink. 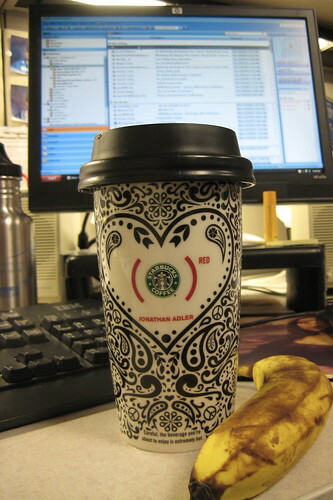 I think the texture of the drink could freak some people out, but I loved it. 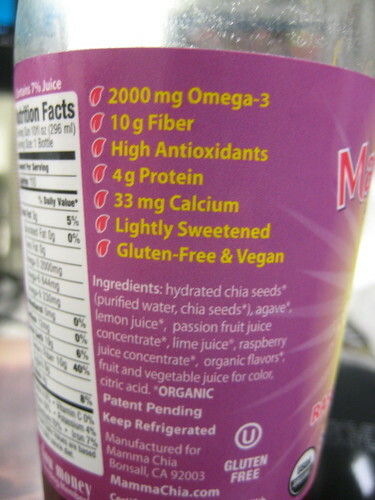 I guess I am used to adding chia seeds to my smoothies, so I probably wasn’t too surprised by the texture because of that. 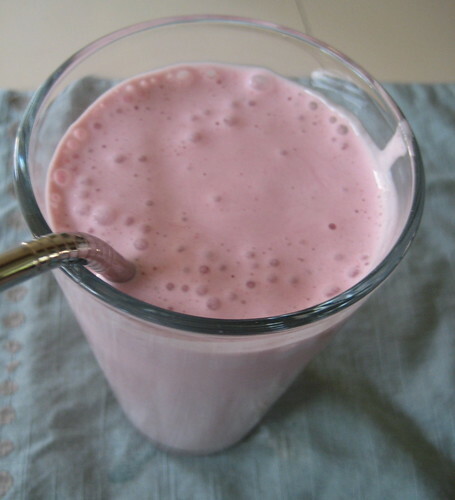 For lunch on Monday, I tried the Raspberry Passion flavor. 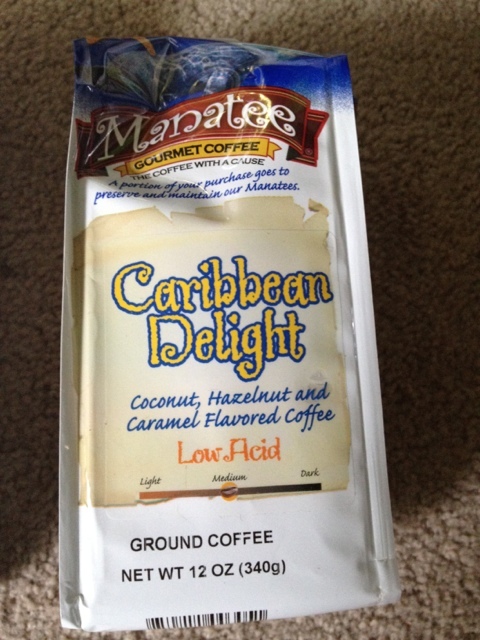 I’ll probably do a full review of the drinks sometime in the near future. 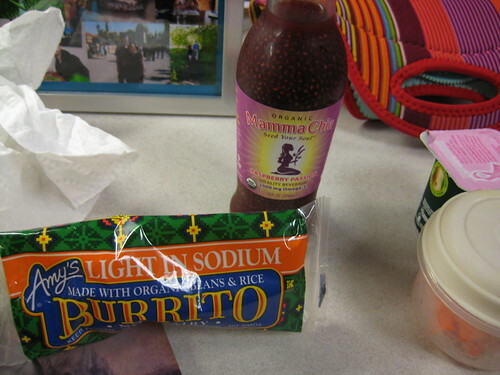 I also tried one of the frozen bean and cheese burritos from Amy’s Organics. 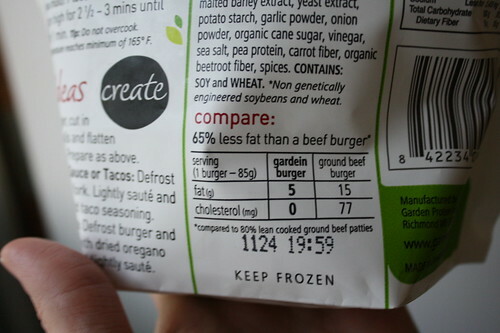 I love their products, but this one disappointed me. I don’t think it was the company’s fault, but it was just really plain and boring. 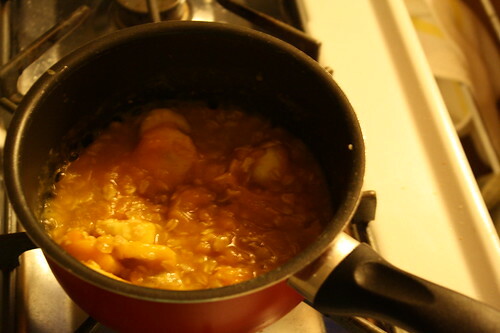 I should have known it was something I could have easily put together the night before and could have added some more ingredients to make is tastier. 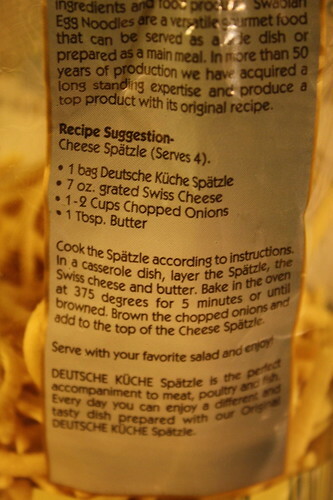 Last night, I finally made cheese spaetzle, as I wasn’t feeling so great on Sunday and never got around to it. 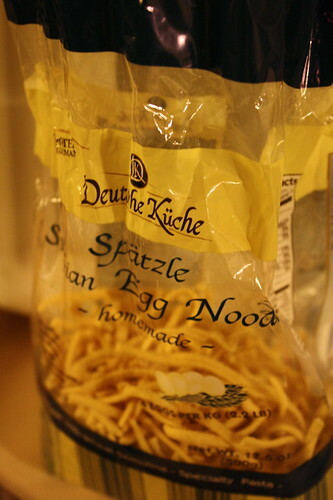 I always use the cheese spaetzle recipe found on the Egg Noodles spaetzle bag from Aldi. 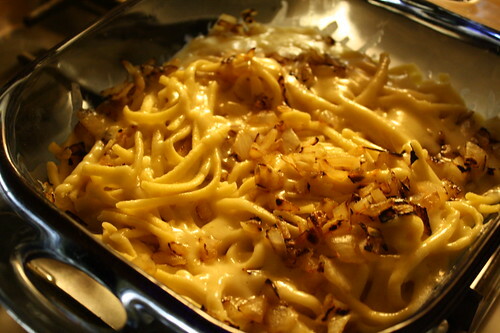 Have you tried spaetzle before? 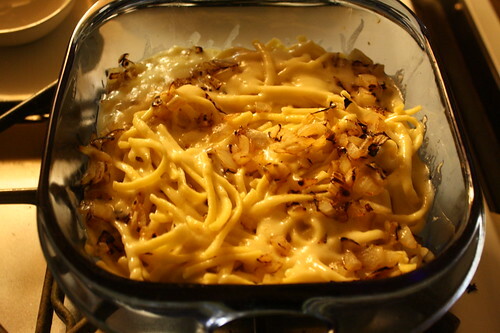 I kind of love it and it’s my comfort food. After having it in Berlin on our honeymoon, the taste reminds me of the cute restaurant we ate at by candlelight. 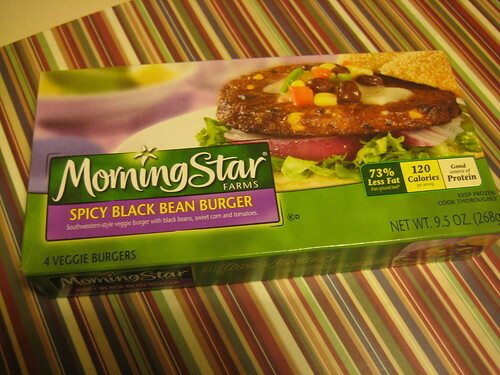 And tonight, I tried the Gardein meatless burger. 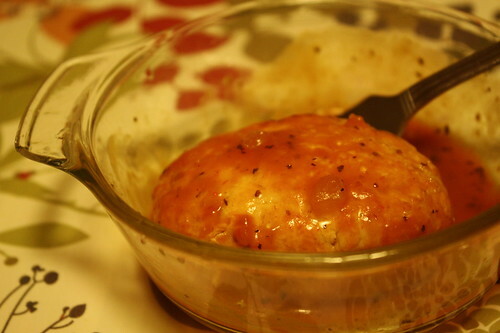 I have tried other Gardein products before and they’re always really good. 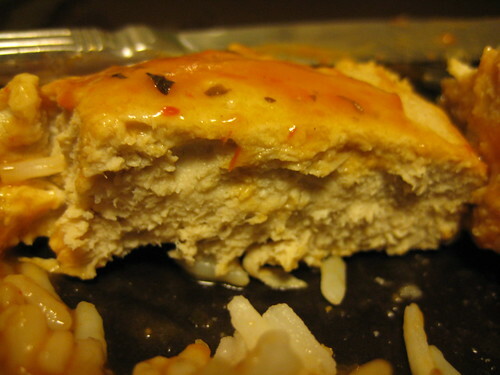 I put it in a tortilla shell with spinach, swiss cheese, and a little bit of Frank’s Red Hot sauce. 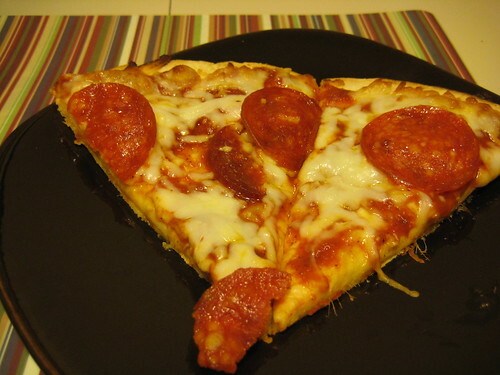 It was a delicious combination! 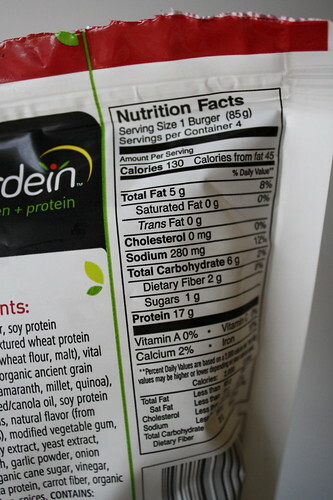 If you are looking for a veggie burger that has a true meat flavor, then try the Gardein. I thought the flavor was really good overall and so did Craig. 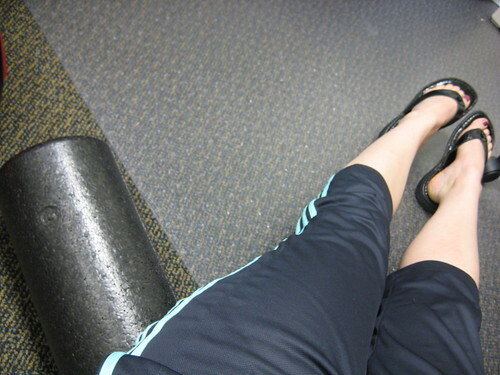 My workouts have been ok this week–Monday, I biked at the gym and lifted weights; yesterday I counted cutting the grass as my workout because I was so tired after work and tonight I walked and ran on the treadmill and lifted weights. I definitely need to do yoga tomorrow night! Time to go read on the kindle. 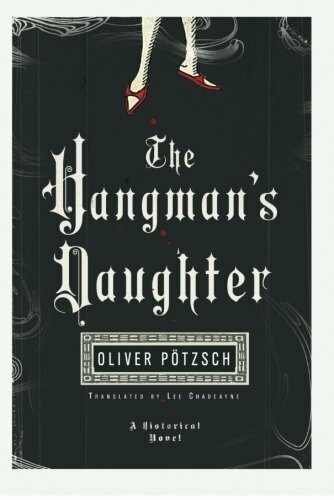 I started a new book called The Hangman’s Daughter. 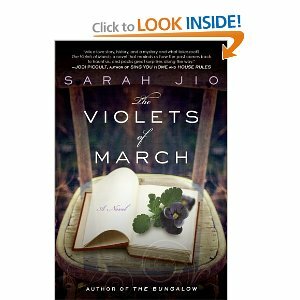 It’s set in 17th century Germany and I am finding the story really interesting so far. Does anyone else believe that the full moon brings out the crazies? I didn’t know why today was so horrible and nuts until at the end of the day, a few people in another department had told me that they experienced the same craziness and it was a full moon tonight, so that explained everything. Let’s just leave it at this: I didn’t have a good day. I know that I need to change the way I react to issues and be more positive. I also know other things that I cannot say on here, but wish I could. 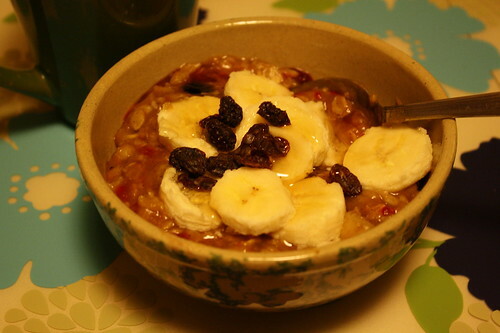 My day started off right…I made a glorious and filling bowl of stovetop oats for breakfast this morning. 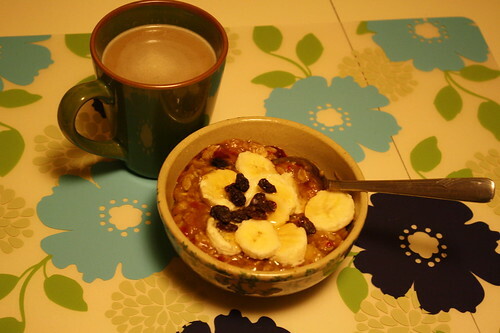 I added Libby’s pumpkin (about a 1/2 cup), all spice, cinnamon, a whole banana, frozen berries, vanilla extract, honey and a few raisins for some chewiness. 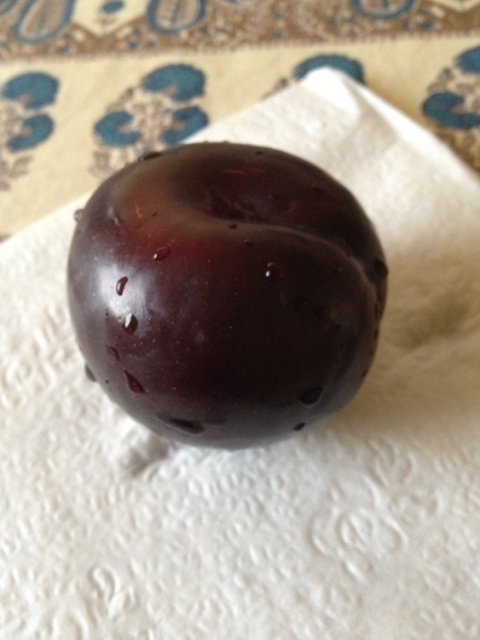 It was very tasty and satisfying! 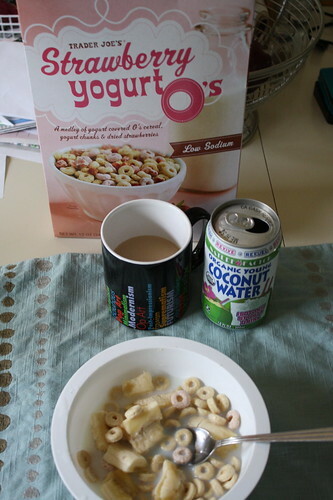 Much better than my cereal and milk breakfasts. It did take more time to make, so it’s for those mornings when I have the time. 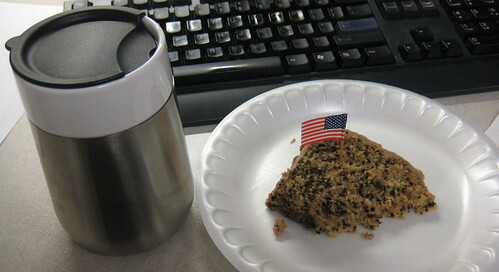 Snack at work was another cup of coffee with some Newman’s Own Organics mini pretzels. 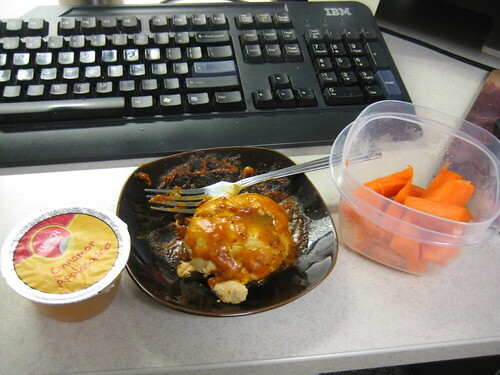 Lunch was gardein’s santa fe good stuff, a cinnamon applesauce and a lot of carrots. An unpictured dessert consisted of two strawberry laffy taffies. 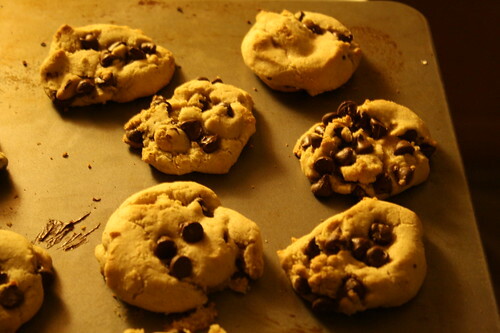 When life hands you lemons, go home and bake chocolate chip cookies. 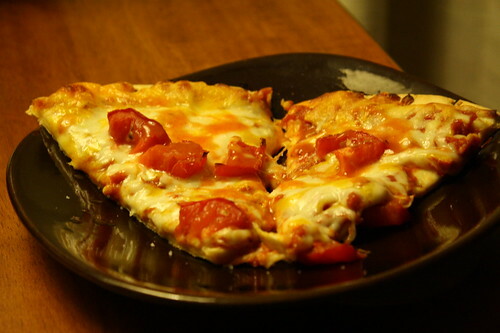 Dinner was frozen pizza. 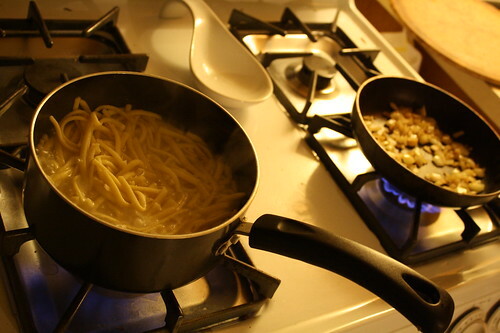 I was so tired that cooking was the last thing on my mind. I needed to bake comforting cookies, not cook. Yoga was at home with Craig instead of at the Y. I left work late and then Craig said we could do yoga at home, so that settled that. I really missed my Y yoga class, but will do it this Thursday evening. I guess on my really bad days, I just freeze and don’t want to do anything. Anyone else do this? 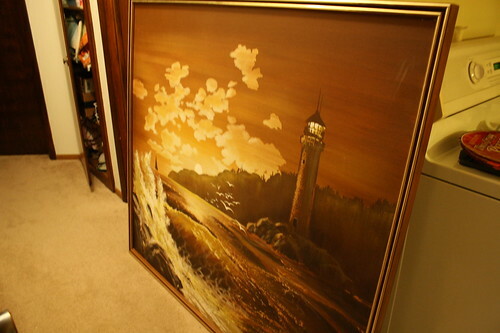 Or any good tips to get out of a funk when you are in one? I realize I haven’t been getting enough sleep during the work week. On the weekends, I sleep in until about 7 or 8 and go to bed around 10:45. That amount of sleep feels perfect. At work today, I wanted to eat sweets and was always hungry. To me, those two elements signal that I am not getting what I need in sleep. I currently go to bed around 10:30 and get up at 5:50, which doesn’t leave me with quite the rest my body needs. My goal for tonight is to try to get to bed by 9:30 or 9:45. Don’t know if that will happen Tuesday through Thursday nights of this week, as I am babysitting my nephews and working Wednesday/Thursday until 9 p.m. At least I will be able to sleep in on Wed/Thurs. 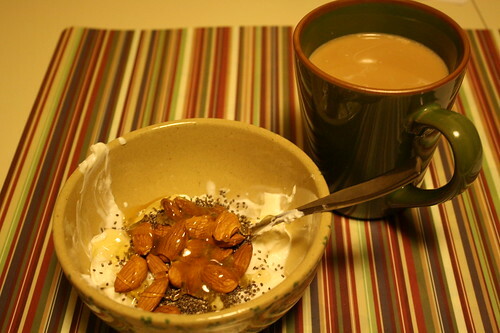 Do you crave sweets when you are tired? 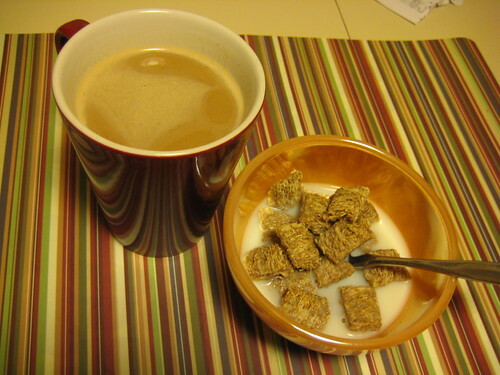 My breakfast included one of the new cereals I picked up at the grocery store on Saturday. 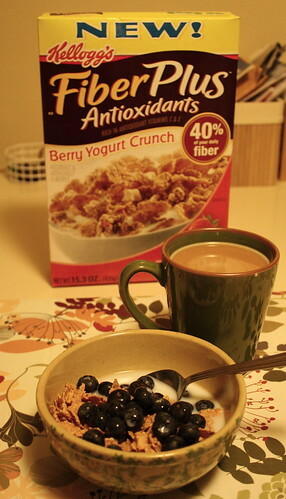 Kellog’s Fiber Plus Antioxidants Berry Yogurt crunch cereal with fresh blueberries. 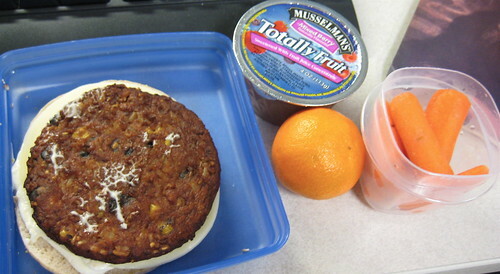 It was ok. Didn’t have a ton of flavor, even with yogurt pieces thrown in. 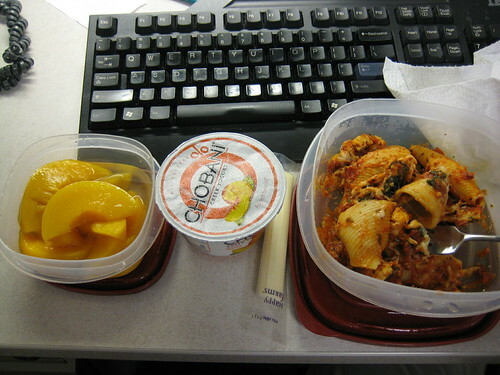 Lunch was leftover Baked Stuffed Shells, a peach Chobani with canned peaches on top, & a string cheese. 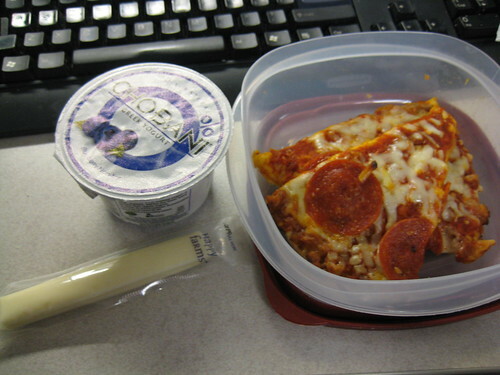 As I mentioned, I was craving sweets today and for some reason, that lunch didn’t fill me up completely. After a meeting, I went to buy some peanut butter cookies out of the vending machine. I think I have only bought cookies of out the work vending machine one other time. Not bad for almost three years at my job! 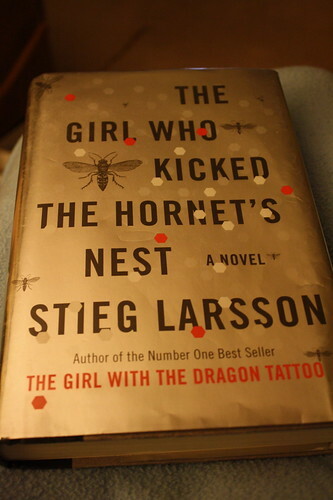 After work, I picked up the third and final Stieg Larsson book from the library, The Girl Who Kicked the Hornet’s Nest. Maybe I will read two books in January and start my New Year’s goal off on the right foot. As for the other Larsson books–I plowed through the first one, went a bit more slowly through the second and who knows how fast I will read this third and final book by Larsson. He is an excellent writer and I wish he was still around to share more intriguing stories with the world. Can’t wait to log off of the computer, bake some chocolate chip cookies (so I don’t have to buy any from the vending machine) and dig into this book tonight! Besides Friday, it is truly my only relaxing night this week, so I am going to enjoy it. Since it was snowing out before and when I left work, the drive home was slow going and I didn’t make it to Boot Camp in time. I just headed to the YMCA on my own and did 25 minutes on the recumbent bike while watching the HGTV dream home special–love watching all of the beautiful touches they add to those houses! I also did 10 minutes on the stair stepper, which I must say is a good workout because I was sweating after those 10 minutes! I also lifted some free weights for my arms. I already knew what I wanted for dinner when I got home from the gym. My co-worker had some buffalo wings for lunch today and the smell made me want some myself. 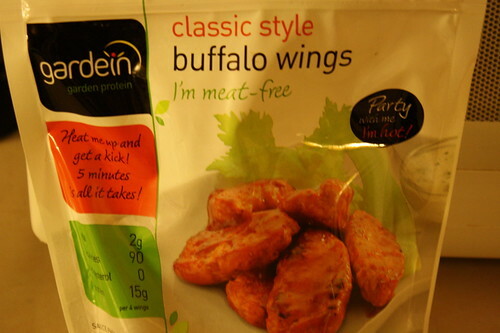 I had the third and final gardein product in my freezer to try out–meatless buffalo wings. 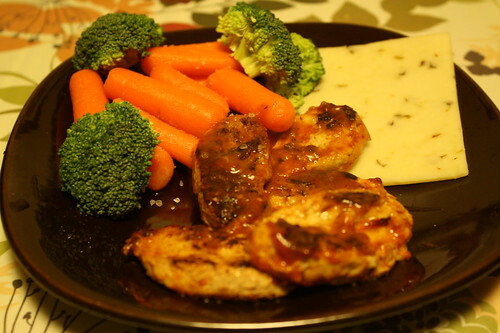 I paired them with a side of baby carrots, broccoli and pepper jack cheese. They were pretty good! 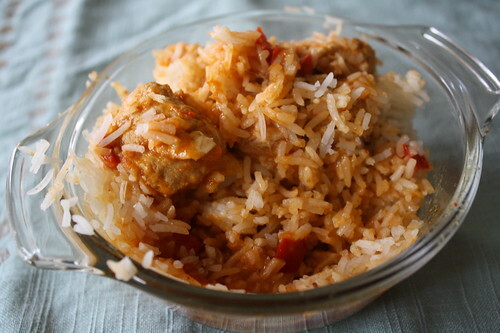 Nice and spicy. I added a little Frank’s Red Hot too, because I’m obsessed like that. 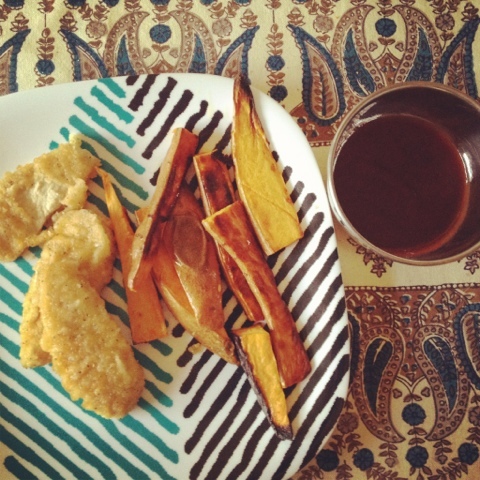 I blogged early tonight and it’s time to read a few blogs, log off, bake and read! Good night! Don’t know if I’ll be able to blog at all tomorrow, but if not, I’ll catch up on Wednesday morning before heading to work. It was “Friday” for me today since we have a three day weekend with New Years Eve tomorrow. I thought it would be an easy day at the office, but I volunteered to step away from my peaceful desk and help out in the public arena. It’s funny because my job title has public in it, but I rarely work with the public face to face! For two straight hours, I helped answer questions, shuffle people from one line to the next, etc. It was fun and the time flew. My workplace has been busy all week, which is wonderful to see, so I wanted our guests to have a positive experience despite the crowds. Helping out was rewarding, but it also made me appreciate my quiet desk, more or less because I am not used to standing in one place like that anymore. My body ached at the end! This is where yoga class tonight came in to save the day! I just got home from there and I feel so much more relaxed and less achy. We did a couple of new poses tonight and always like trying new things in fitness classes, so that was cool. We concentrated on lots of twists, which our teacher said was good for our backs and digestive systems. This was perfect for me and especially for the day I had. 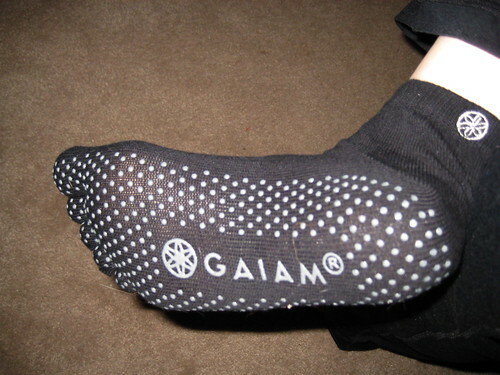 At yoga, I also got to try out my new GAIAM yoga socks that Craig got me for Christmas! They worked really well. The room wasn’t as cold tonight. Despite that, I loved that my feet were warm and the grippers on the bottom helped me stay more stable, especially in certain positions. 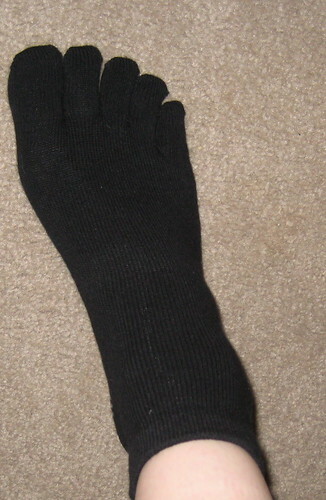 When I put them on, it was hard to separate my toes, but then I sort of forced them into their spaces and it was fine. 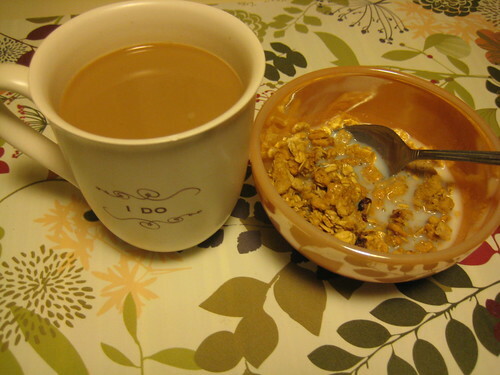 Coffee (in my “I Do” mug in honor of Jenny) and Kashi Go Crisp! cereal. 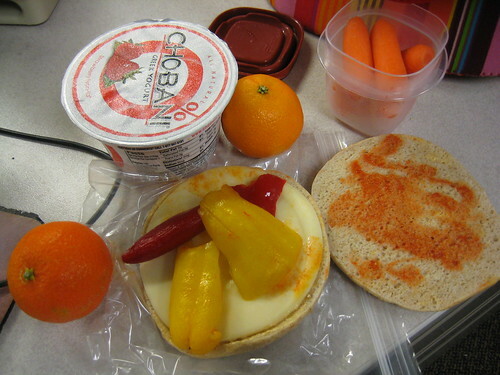 I had an Arnold’s Thin sandwich with provolone cheese and sweet peppers on top. I added Frank’s Red Hot sauce and Chipolte mayo. 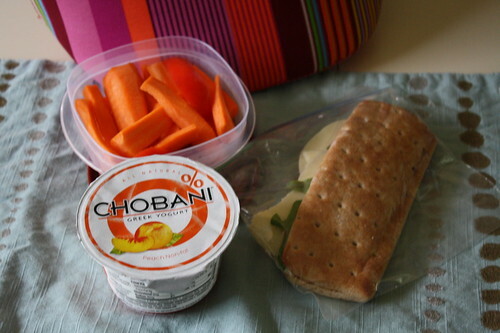 Other lunch items included two clementines (I am trying to use them up), a strawberry Chobani yogurt, and baby carrots. 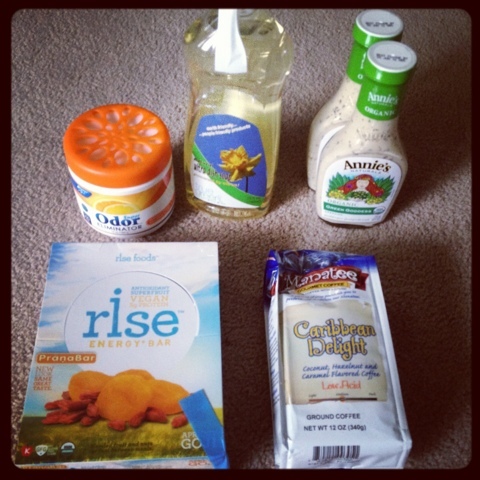 After work, I went to Whole Foods to use up a bunch of coupons for free or discounted items. It was packed there like it was at my work. Must be the New Years eve rush. 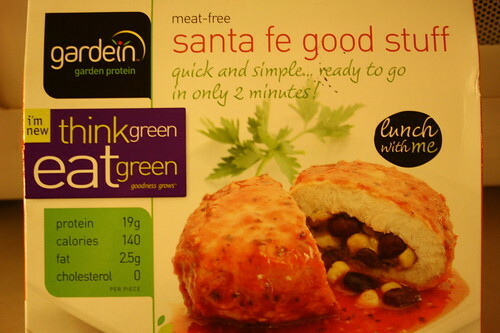 Among other things, I picked up three different Gardein items, which I had never tried before this evening. 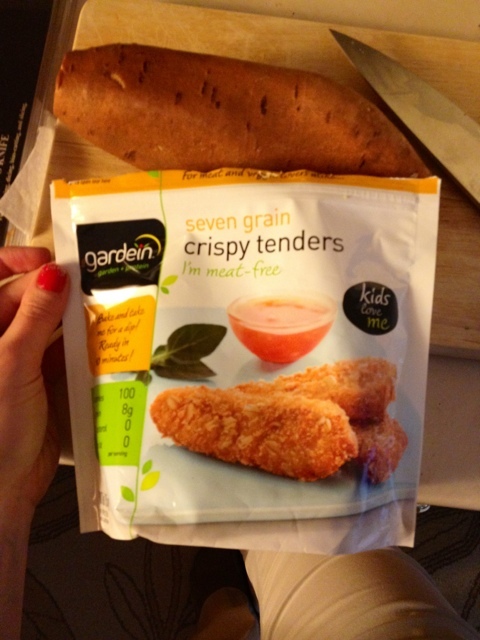 I asked Gardein if I could sample some of their products and they graciously sent me some coupons. 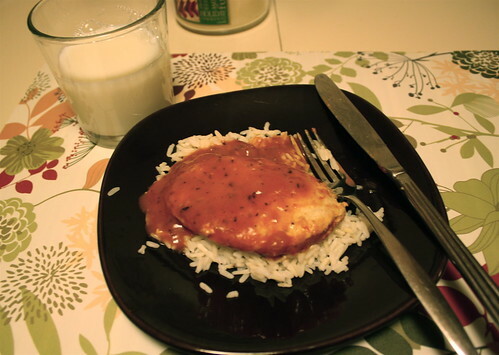 Craig made the rice and microwaved the Tuscan Breasts from Gardein. 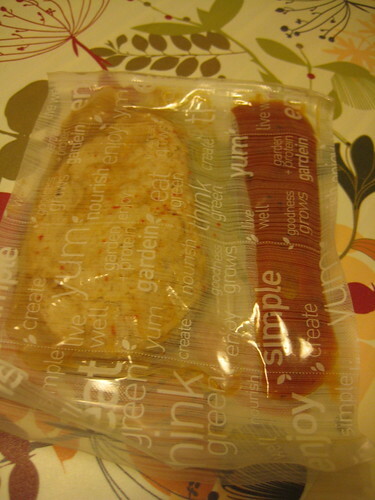 Here is the packaging it came in, which included the tomato basil sauce. We both enjoyed the meal, but I loved the flavor and texture more than Craig. 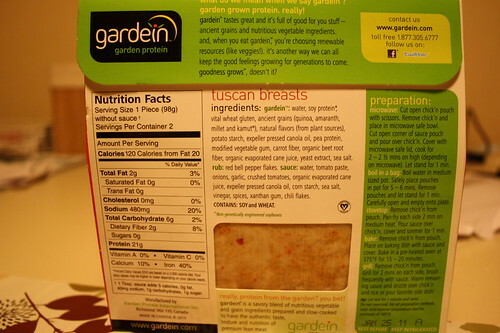 I would definitely buy the Tuscan Breasts again. 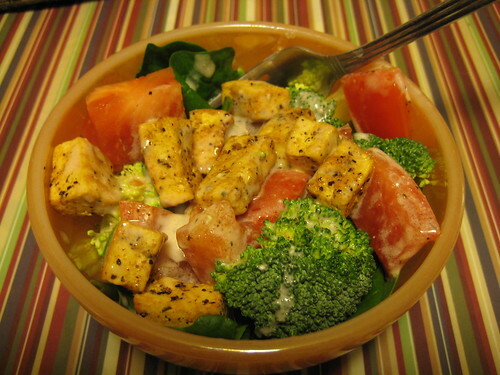 I eat a mostly vegetarian diet and even though I like the flavor of chicken, I don’t necessarily like eating animals, nor does eating meat always agree with my stomach. 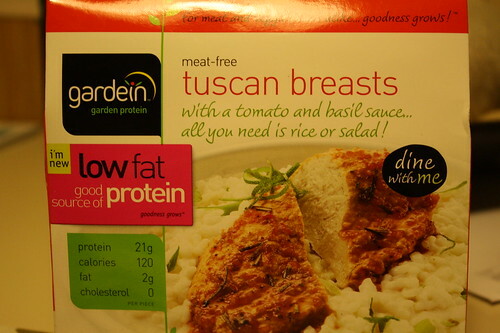 I like that one of these tuscan breasts has 21 grams of protein because I definitely know that I need more protein in my diet. 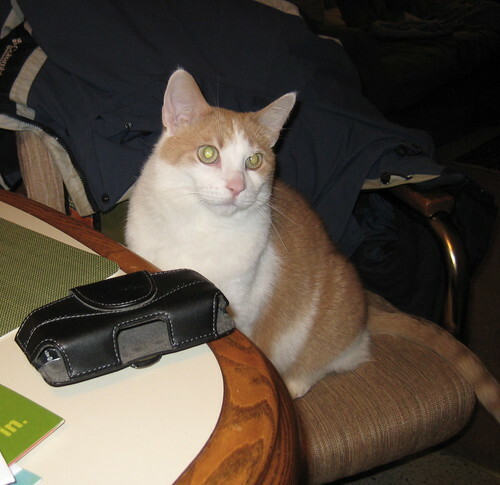 After Craig left the table, Karma joined me. It seemed that he wanted some Gardein too! 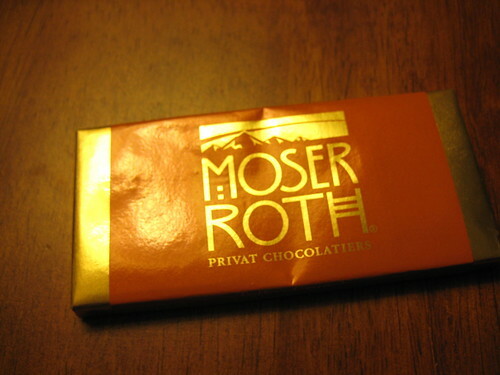 Dessert before yoga class was toffee Moser Roth chocolate.